The Female Rookie of the Year 2016 category received 19 nominations and 39 votes for the Horsepower & Heels Women of the Year Awards. The winner pulled out an early lead, and captured over 30% of the votes. Horsepower & Heels is proud to announce the 2016 Female Rookie of the Year, NHRA Top Alcohol Dragster driver, Megan Meyer! 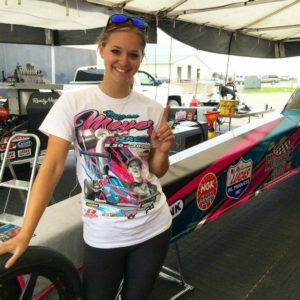 Megan, in her first full season in the competitive Top Alcohol Dragster class, took her A/Fuel Racer’s Evolved Dragster to six final rounds, capturing her first win in Charlotte, and five runner-up finishes. She earned the top qualifying position twice, and finished the season in the No. 4 position Nationally, and No 2. Regionally. Megan also captured several other awards, including Best Appearing Car in Gainesville, and Best Appearing Crew honors in Charlotte. Though only a rookie herself, her poise helped welcome sister Rachel Meyer to the seat as well as mentoring other drivers who partnered with Randy Meyer Racing to earn their TAD license. She returns in 2017 to TAD with the goal of capturing that first championship in the class. Meyer will be joined by sister Rachel mid-season, and the team will also host and mentor Justin Ashley for his TAD debut. NHRA Pro Stock Motorcycle racer, Melissa Surber was your Rookie of the Year 2016 Runner-Up for the Horsepower & Heels Women of the Year Awards.